GMC trucks and SUV’s are built to get you where you need to go. At Mike’s Auto Service, our ASE certified technicians are here to make sure your GMC keeps on going! 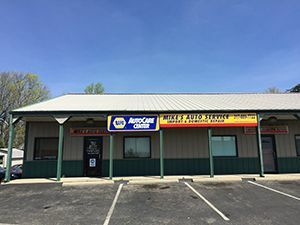 We are a NAPA authorized auto care center conveniently located in Greenwood, Indiana. Our shop is fully-equipped to provide professional GMC service and repair at a fraction of the dealership’s cost. Our strong dedication to work ethic and integrity sets us apart from our competitors, and our economy-based prices prove our honesty as a business. Whether a Denali or Acadia, we offer all services and repairs for all GMC model vehicles, including oil changes, transmission work, engine rebuilds, and more. When it comes to GMC repair services, our certified mechanics know exactly what to do. With more than three decades of experience in the automotive repair industry, we can efficiently diagnose and repair any problem the first time, every time. We have the professional technologies and training to get GMC trucks back on the road in no time at all! With economy-based pricing and high-quality service, you can see why we are the preferred choice for GMC service and repair in Greenwood, IN. Call us today at 317-889-7722 to request a quote, or to schedule an appointment.